Our Products >> Ultraviolet Systems >> TrojanUVMax - C UV Water System. Out of stock. See S8QPA. 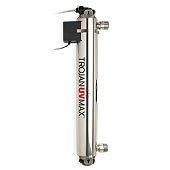 TrojanUVMax innovative UV systems use leading edge UV technology to effectively kill viruses, bacteria, and other pathogens in your water. UV disinfection is a natural process that adds no chemicals to your water. Other disinfection methods, such as those that use chlorine, may create harmful chemicals that have been linked with serious illnesses. Looking after your TrojanUVMax system is easy. All you have to do is periodically clean the lamp sleeve and replace your lamp once a year ? simple processes you can complete in minutes. For ease of handling, the lamp and protective quartz sleeve are designed as one component, but can be replaced separately. High output UV lamps - The UV light is generated from a low-pressure, high-output lamp providing high intensity UV light with smaller, more efficient units. A unique water chamber design - Trojan?s unique water chamber optimizes hydraulic performance and increases disinfection efficiency. New power supply technology - Electronic advances in Trojan?s power supply offer flexibility over a broad range of voltage supplies (90-265V). It withstands fluctuations in voltage while maintaining lamp intensity to ensure continuous disinfection. TrojanUVMax reminds you to replace the lamp - Trojan has incorporated visual and audio signals to remind you to replace the UV lamp once a year.